A system of record is a data management term for an information storage system. In other words, a database. In the PV world, this is the ICSR database and the software that is used to enter those cases into the database. A system of record is a cost center. Licensing, maintaining, and upgrading the database takes significant resources. A system of engagement evolves beyond handling case processing and storage to providing the capability for end-users to engage with those data and engage with other end-users around those data. Signal management software allows for aggregate signal detection and the ability for users to take those data and organize them as they deem appropriate. Systems of engagement create efficiencies that lead to cost reductions. A system of intelligence connects with other systems and data sources to produce actionable intelligence. This not only creates efficiency, but also revenue potential. The concept of PV generating revenue may seem foreign but can occur when the function serves not only its regulatory purpose, but contributes to commercial decisions. PV Analytics are a system of intelligence where end users take advantage of disparate data sources through a modern user experience. This chart illustrates the importance of pharmacovigilance software evolving from a system of record to one of intelligence. With software evolution on the Y axis and value to organization, low to high, on the X axis we can plot four key PV functions: Database, Case Processing, Signal Management, and PV Analytics. Much of the technology being developed now in pharmacovigilance is focused on creating further efficiencies and reducing costs. Big tech players are utilizing advancements in artificial intelligence and cognitive computing to automate case processing. This is a huge need with significant cost saving potential. It can also free up resources to focus on higher value, revenue generating pursuits. 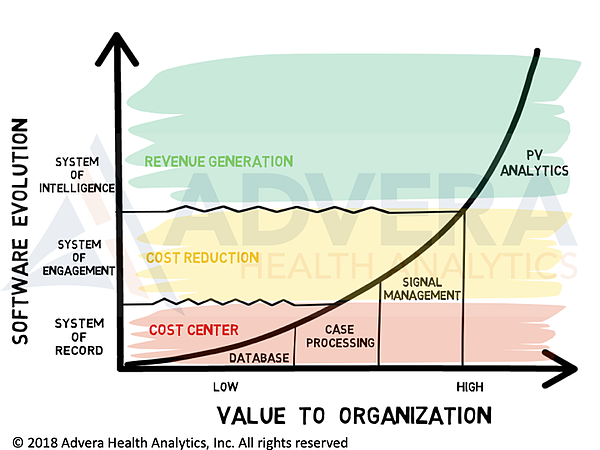 At Advera Health, our focus is centered on creating a system of intelligence. Our technology is built around the concept of connecting disparate data sources and providing a user experience that allows non-data scientists to elicit actionable intelligence from those data, to not only fulfill their regulatory duties, but to be of greater service and value to the entire organization. We’ve built our Evidex platform with the ability to link to internal ICSR databases, FAERS, VigiBase, Social Media, and other RWD and have recently added a validated, audit ready environment to track and manage safety issues that are found in those data. Our goal is to continue to innovate and refine the system of intelligence that supports the next generation of pharmacovigilance. Read more in our Complete Guide to Pharmacovigilance Software.